We are now SUPER close to the first beta release of the new map: "Oregon". We are going to roll out this final (small) patch to prepare everything. This patch will include a server restart and a client patch so servers will be down for a short while. Oregon will be available after this restart. Oregon is going to be available any time in the Open World Official Servers list. Be ready! Improved right-peek third person animations for the IMI TAR-21 and L85 assault rifles. Improved overall spawn and respawn system on big maps such as Colorado V2. Improved the minimap of Oregon. Also updated the colors of the water. Fixed a (major) bug where when aiming with a sniper in third person sometimes you would randomly aim high up in the air / any random location. Fixed some issues in the Hong Kong servers that were causing problems. Fixed some material and texture issues. Fixed some server and client crashes. Oregon will be beta released very soon. We understand there is a lot of questions from you all how and what exactly is going to happen. What does the beta release mean? The beta release of Oregon means that we are still working on the map but at the same time give the community the chance to try the new map out already. The current playable area that we will release for players is already the size of the current Colorado V2 map so imagine how big the map is going to be in the end. During the beta period we aim to fix as much issues as possible and improve the playable area as good as possible where we aim to fully release the map in a few weeks. We will do all this mostly based on feedback from community and moderators. During the beta release Oregon will only be available in the Open World Official Servers list. Only a few servers in each region will be available with this map. When will private servers be available for renting? The full release of Oregon will be in a few weeks. When we fully release the map this means that it will be permanently available in the as Open World Official Servers and will be rent-able as private server. This in all regions. 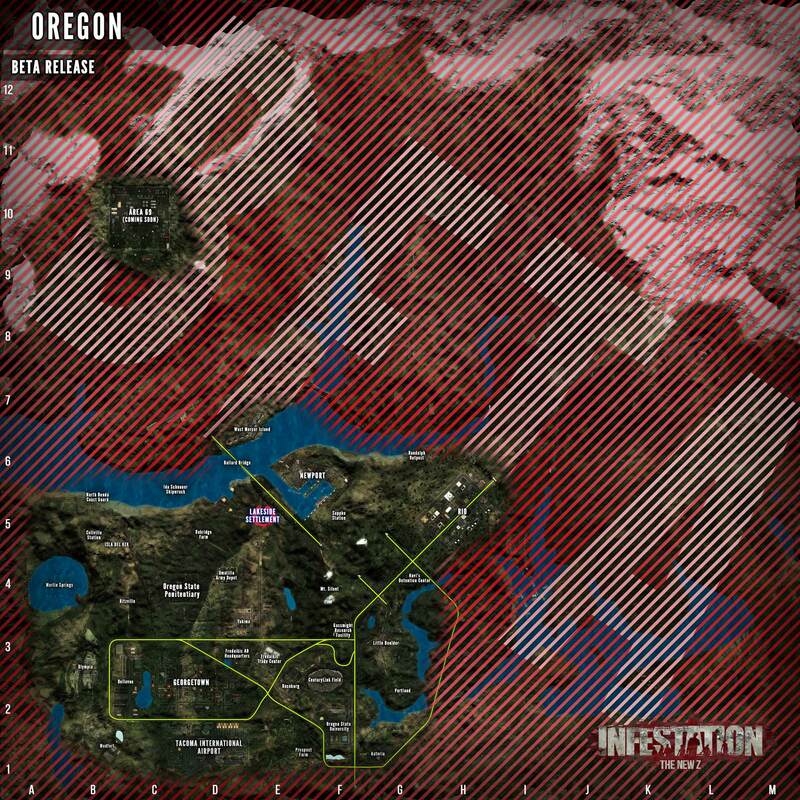 How many servers will be available with the Oregon map during the beta? We will base the amount of servers on the demand of players. This will also be different in each region. We will add and or remove servers based on what the player demand is where we start with a basis of around 3-4 servers available in each region. Once again for this beta release we will only have Oregon live and running in the Official Servers section in the Open World game mode. What does the red areas mean on the map? When will players be able to go here? The red areas on the minimap indicate areas where players can't go (yet). Only the down-left area of the map is playable and available for now. In future patches we will slowly start expanding the playable area where it pretty much keeps increasing and increasing. If you have any further questions feel free to ask us in the comments or just link us through our social media channels. Estimated patch size: 200 mb. Patch ETA: Patch is about to be rolled any time. Estimated downtime: Server downtime will be minimal. Client & Server update are required. Extra information: If you experience an error like "Cannot replace TheNewZ.exe ...." please go to your game installation folder and delete TheNewZ.exe manually and start your launcher again. If the issue is still not fixed go to your antivirus settings and make sure TheNewZ.exe is not blocked anywhere and whitelist it if possible. HYPE! Servers going down soon. Just chillin waiting for players to come by my house. UPDATE: Oregon will be available after this restart. GAME IS ONLINE. OREGON FIRST BETA IS LIVE NOW!. Enjoy! Great Job to everyone that worked on the Map! Hopefully Oregon can be in the Survival servers (a separated game mode with new GI) soon! Ive noticed a issue with the bus stops on oregon,If you or your team mates use the bus stop then you go to use it the bus stop they teleport to then disapears from my map and i cant teleport over there with them because the bus stop they have chosen dissapears from my map! ,I have to log off,Then join in on a friend to spawn with them,This has happened on a couple of occasions,Never happens on Colorado though. Also those clan territory markers are annoying tbh they clutter the whole map up,Maybe have a setting to disable them from been shown in the player settings because i personally couldn't care for them anway tbh.